It’s our brand new Petey Penguin Collection! 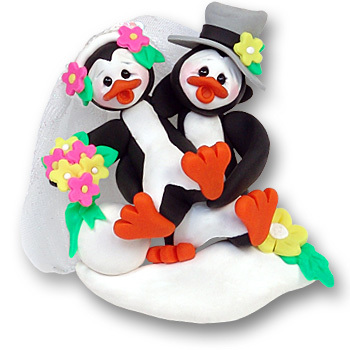 Petey & Polly finally tie the knot in this spring time wedding ornament! She is all dressed up with her bridal veil and bouquet as Petey carries her over the threshold to their brand new igloo. This is a great ornament for a just married couple, a personalized first Christmas ornament or an anniversary. As is the case with all of our ornaments, this one in particular is extremely detailed. Polly’s veil is made from real fabric to give it that extra hand made touch. This ornament is easily personalized but looks great without. Handmade from polymer clay and designed by Debi Allison. It comes complete with a hook and satin ribbon for hanging. Here comes the bride…and the groom!